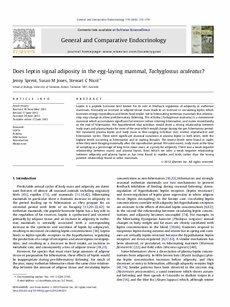 eCite - Does leptin signal adiposity in the egg-laying mammal, Tachyglossus aculeatus? Does leptin signal adiposity in the egg-laying mammal, Tachyglossus aculeatus? Leptin is a peptide hormone best known for its role in feedback regulation of adiposity in eutherian mammals. Normally an increase in adipose tissue mass leads to an increase in circulating leptin which increases energy expenditure and limits food intake, but in hibernating eutherian mammals this relationship may change to allow prehibernatory fattening. The echidna (Tachyglossus aculeatus) is a monotreme mammal which accumulates significant fat reserves before entering hibernation, and mates immediately at the end of hibernation. We hypothesised that echidnas would show a strong relationship between body mass and plasma leptin for most of the year which would change during the pre-hibernatory period. We measured plasma leptin and body mass in free-ranging echidnas over several reproductive and hibernation cycles. There were significant seasonal variations in plasma leptin in both sexes, with the highest levels occurring in hibernation and in mating females. The lowest levels were found in males when they were foraging maximally after the reproductive period. We used mass%, body mass at the time of sampling as a percentage of long term mean mass, as a proxy for adiposity. There was a weak negative relationship between mass% and plasma leptin, from which we infer a weak negative relationship between adiposity and plasma leptin as has been found in reptiles and birds, rather than the strong positive relationship found in other mammals.